Nokia launched its next generation android smartphone Nokia X2 Dual SIM in India at Rs 8,699. This phone was launched in the international market in June. This phone is new variants of X series. The new Nokia X2 Dual SIM Smartphone comes with 1 GB RAM with 1.2 GHz Dual-core processor, running on 4.3 Android Jelly Bean and available at Rs. 8699 only. Earlier, Nokia launched XL, and X + was 768 MB RAM. Nokia X2 has 1GB RAM and Dual-Core processor. Nokia X2 is a Smartphone phone which is available in Dual SIM with 3G facility. This phone available Different Color Variations like as Glossy green, orange black, yellow, white and matt dark grey. This phone comes with 1.2GHz Dual-core processor with 1GB of RAM and an Adreno 302 GPU. It has 5 MP with auto focus, LED flash facility on rear and VGA front facing camera. This phone has 1.2 GHz Dual-core processor which is very power and will give high speed. This phone may prove excellent in multitasking as it has 1GB RAM too. Nokia X2 has Qualcomm MSM8210 Snapdragon 200 Chipset with Adreno 302 GPU. Nokia X2 has 1GB RAM With 4 GB ROM and user can be expanded memory up to 32GB via SD Card. Nokia X2 has 4.3 inches Screen. It has IPS LCD capacitive touchscreen with 480 x 800 pixels Resolution. The screen is also given Scratch-resistant glass and Clear Black display protection. Its screen can display 16 million colors. Nokia X2 has 5 MP Rear Camera with 2592 х 1944 pixel Resolution. It has auto focus, LED flash and geo-tagging, touch focus, face detection and 1/4” sensor size. It has VGA front facing Camera. 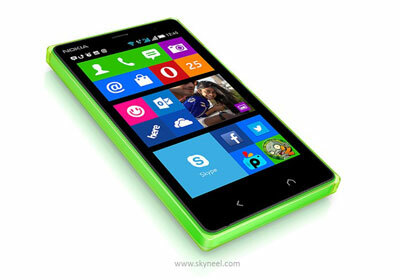 Nokia X2 is a stylish phone, its dimension is 121.7 x 68.3 x 11.1 mm and weight is 150gm. Nokia X2 runs on 4.3 Android Jelly Bean. It supports Java and browser flash.The Smartphone has a Accelerometer, proximity and Maps, Calendar, Google Search, Gmail, YouTube, Google Talk, Alarm, Calculator, Clock, and other Google sync apps. It gives users 7GB free OneDrive storage facility. Nokia X2 has supports 3G and 2G (GSM) networks, Bluetooth and Micro USB. Nokia X2 has Li-ion 1800 mAh battery power which is very good for user. 1. Nokia X2 has Dual core Processor. 2. Nokia X2 has good rear camera resolution. 3. Nokia X2 has 1GB RAM. 1. Nokia X2 has heavy weight. 2. Nokia X2 has low resolution front facing camera. 3. Nokia X2 Doesn’t TV-Output.